In this episode of The Handyguys Podcast the Handyguys Brian & Paul continue their interview with Paul Mackie from The Western Red Cedar Lumber Association. Can a handyguy build his own deck. 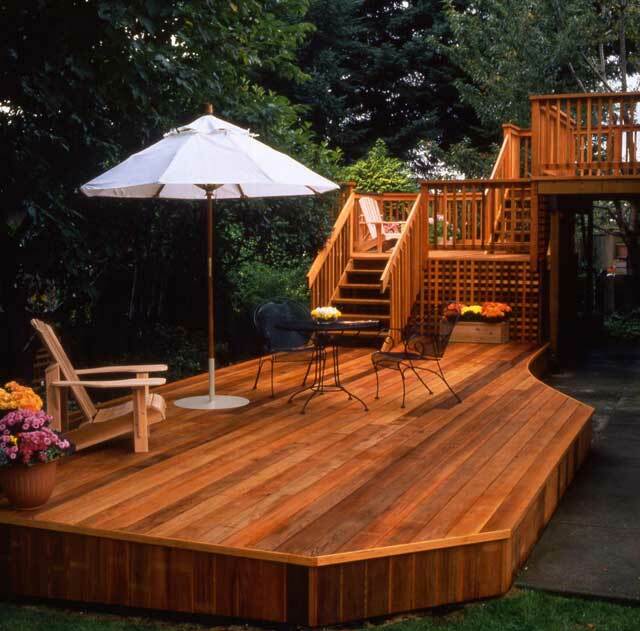 Thanks to Western Red Cedar Lumber Association for this picture of a great looking deck. Click for full size. What are some of the skills needed to build a deck? The Handyguys, Brian & Paul, discuss what it takes. The conclusion – if you are handy you could build a deck and save some money in the process. If you are building a second floor deck or if you deck is high you may want to consider having someone do the framing. Height ads complexity plus safety may be a concern. Listen to the Podcast for the full discussion. The Handyguys wrap up the discussion talking about comprehensive landscape design. You may want to consider hiring a landscape designer to help you come up with a complete plan including hardscape, plants, shrubs and lighting. Thanks to Mr. Cedar, Paul Mackie, of the Western Red Cedar Lumber Association for a great interview. Brian & Paul continue to discuss the tools after Mr. Cedar signs off. There is a minimum compliment of tools you will need. The Handyguys like their tools and discuss some upgrades that would make building a deck easier. The table below shows the minimum tool and a possible upgrade. You can click each picture for a full description and purchase option for each tool. The photo from Western Red Cedar Lumber Association is gorgeous. Too big of a job for this handy man but a great inspiration anyway. My deck project was just re-staining a current deck so not nearly as involved. But I like to see what other people are doing. There are lots of great photos on the net like at instructables.com and http://www.yardshare.com. Good advice too. Yea, I like that one too. My wife hasn’t seen it yet. Its similar to what she will want! Thanks for the comments. I am looking to make the shades that you have in the above picture. Do you have directions? We are replacing a 600 sf deck. It is not covered. We want a deck that will not have to be re-stained regularly as we are elderly. That is just too much backbreaking work. The concern is we have tons of little fir cones (no leaves) that constantly fall on our deck . We will sweep once a week, and clean the deck once or twice a year. I understand composite decking is low maintenance, but I am concerned about the cones causing mildew. I thought about cedar or some other wood and just painting it, rather than staining it. I have thought about Ipe, but again worry about the cones causing stains. Do you think the Cellular PVC Decking by Azek is less prone to mildew and mold? I am wondering if Azek might be more smooth (not embossed), or any other composite product? I am leaning towards painting wood. Any suggestion? I think the PVC products will be the lowest maintenance. Composite materials can grow mold more easily. Painted wood will need repainted someday and that is hard to do on a deck, I would avoid that. I think PVC will be what you want. Azek is a good brand but there are others.